POTEAU (KFSM) – Greg Werner is no stranger to changing jobs but the long time coach won’t have much of an adjustment to make for his newest job. Werner is expected to be approved as the new head football coach at Poteau tonight as they are holding a school board meeting. Werner coached the Pirates for three seasons (2012-14) and led Poteau to a 24-11 record and a berth in the 2013 state title game. 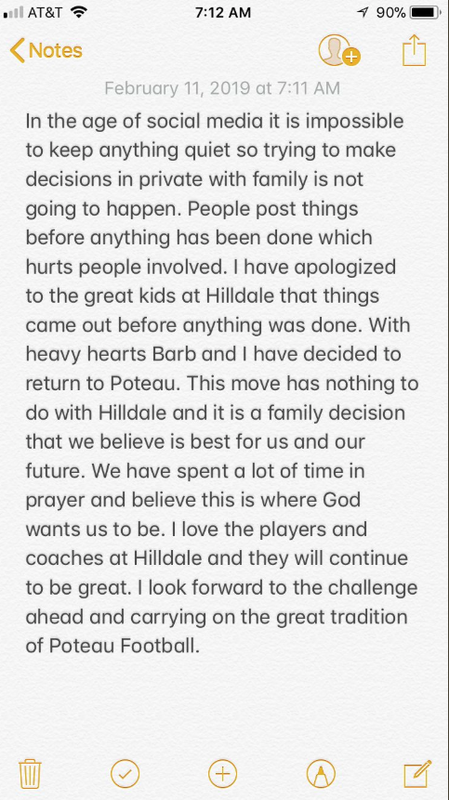 Werner left Poteau to take over 7A Van Buren but struggled with the Pointers as he won just two games in three seasons before leaving to take over at Hilldale in 2018. He then led the Hornets, who play in the same conference as Poteau, to a 9-3 season and a trip to the 4A quarterfinals. In his career, Werner has a 213-125 record with stops at Broken Bow, Poteau, Roland, Van Buren and others. Poteau was left without a coach in mid-January as Forrest Mazey left the Pirates to take over at McAlester. Mazey went 37-11 in four seasons, including a 12-1 mark in 2018.